This plastic travel case will fit 1 toothbrush handle along with 2 brush heads. 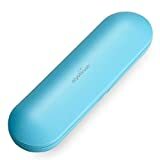 Keep your Sonic Toothbrush handle safe and protected with this travel case. Take electric toothbrush with you wherever you travel. Brand new out of packaging. Low Noise Sonic Technology- with up to 21,000VPM brush strokes per minute,removes up to 100% more plaque than regular toothbrush,give your children a healthy oral care. Longest Lasting Battery- One full charge with 6 hours can last 100 days for twice brushing per day,ideal gift for travel. Two Professional Brush Heads— Specially designed to clean teeth softly,as good as famous brand brush heads. Aiyabrush Electric toothbrushes will make brushing fun for your children, giving kids a deep cleaning for teeth. Aiyabrush ZR101 Sonic toothbrushes are more effective at cleaning teeth than manual toothbrushes, can help prevent tooth staining, and will lower your risk for toothbrush abrasion. Aiyabrush move back and forth over the surface of your teeth at high speed, scrubbing away the plaque. Our powerful motor deliveries 21,000 brush strokes per minute. We provide two-year manufacturer warranty against defects in materials and workmanship under normal use.